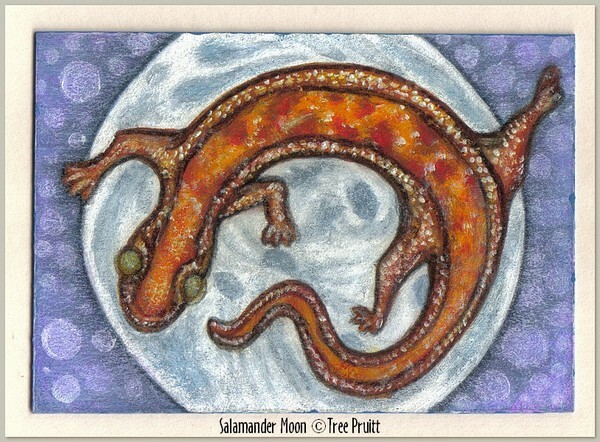 Original ACEO mini art featuring a vibrantly colored salamander over a mystical Full Moon. *protective clear toploader sleeve and black frame rigid toploader for display; made of high impact 16 mil rigid archival PVC. Perfect to have mounted in an oversized mat and frame, or may be kept in included PVC sleeve for display. Just like sports fans collect baseball cards of their favorite players, art fans collect art cards of their favorite artists or artwork. An art card is a small pocket-sized piece of art. They are commonly know as ACEO (Art Cards, Editions & Originals) as well as ATC (Artist Trading Cards). ATCs are only traded between artists, ACEOs are normally purchased. They can be original artwork or prints/reproductions of original artwork. These cards are bought, sold and traded all over the world! The official standard size of an art card is 2.5" x 3.5" (64 x 89 mm). ACEO's make excellent contemporary framed wall art with over sized matting. Ooo I Love him!!!.. excellent work indeed! Artist Reply: Warm hello and thank you for commenting on Salamander Moon! This si so expressive and full of charm, Tree! Artist Reply: I'm so glad you enjoyed my little salamander, Regina! :) Thank you! Artist Reply: Thanks so much Sharon!